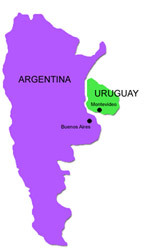 Argentina (Buenos Aires) and Uruguay (Montevideo-Atlantida). This is possible because the Spanish school is only one: It has the same headship, the same academic program and study material. Instructors of both Spanish Schools know each other well and are in permanent contact with each other. By studying in our Spanish schools of Argentina and Uruguay not only provided you with a solid learning of the Spanish language but also a complete understanding of the Latin American culture. Montevideo, the capital city of Uruguay, has got stunning natural beauty, for example, its 28 km of coastline. It is a city open to the horizon where there is an authentic fresh air. Atlantida is a quiet town of Uruguay with only 7000 inhabitants. It offers beautiful beaches of white sand in the coastline of the Atlantic Ocean. Buenos Aires is a city that never ends and keeps always changing. In one hand the city still holds the traditions regarding the endless café chat with friends and the Sunday football matches and in the other hand Buenos Aires is a cosmopolitan city which always surprises its visitors. It is as Bohemian as Tango and refined just like its architecture and avenues. Being faithful with the Idiomatic Tourism we make you possible to travel visiting more places without interrupting your learning: Do not miss out this opportunity.